IN the early morning of Feb. 5, I guided an experienced taxi driver to a nondescript and obscure hotel in Makati using Google Maps, GPS and my Android phone. It was something almost right out of the movies—we were getting a real time rendering of where we were on the map (indicated by a moving blue dot) and using it to find our way through Isabelle Royale Hotel and Suites (I told you it was obscure). On Feb. 4, I took the red-eye flight to Manila for the Condura Skyway Marathon with my wife, Marlen, and the kids. For that trip, I took copious notes of travel details in my phone, an LG P500 running Android Froyo, instead of the handy paper notebook I used to always keep with me. VIRTUAL GUIDE. Google Maps uses GPS to pinpoint my exact location on the map. 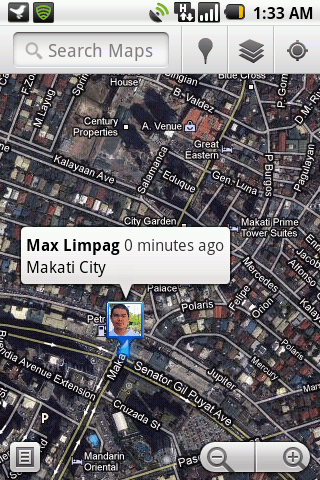 Using the system, I was able to guide a taxi driver to an obscure hotel in Makati City. I kept travel details in Springpad–a free notes-taking web service that has mobile clients for smartphones like the Android and the iPhone. Springpad is a really great web and mobile application that’s very useful for writing and organizing notes. I’ve used Springpad in my Android phone for more than a month and find it indispensable. I came to Springpad from Evernote, another free note-taking service with mobile clients. While both are great web services, I prefer Springpad because I find that it fits my workflow better. Since we would be arriving in Manila at past midnight, Marlen and I were worried about finding our way to the hotel. Hours before our flight, I took a screengrab of the Google Maps rendering of the areas leading to Isabelle Royale Hotel and Suites intending to show it to the driver. But the driver of our cab said he wasn’t that familiar with the place. I suspected he was feigning ignorance. I turned on Google Maps and GPS intending to to check where we were on the map so that we could find our way to the hotel. I was pleasantly surprised to find that Google Maps renders your location in real time. I was connected to Smart’s HSPA (a high-speed mobile Internet network) network and the map tiles were downloading and rendering flawlessly—fast enough to keep up with us, as represented by that blue dot on the screen. Maybe I was just lucky or maybe the network wasn’t as congested because it was early in the morning (I encountered some lag in buffering maps data when I used it early in the afternoon two days after). HOW long does your initial fascination with a new phone last? Two weeks? A month? In my case, it used to take about two weeks before the novelty of a new unit started to wear off. But not with my LG P500, a device that has Android 2.2 or Froyo as operating system. Two months after buying it, I’m more fascinated and attached to it today than in the day after I unboxed the unit. Before Android, I wouldn’t have considered buying either a Samsung or an LG unit. I was a Sony Ericsson and, later, a Nokia person. It was such a hassle having to transition to another mobile phone brand and relearn everything—from quirks in the keypad to the way other software components worked.